While channeling my inner Pioneer Woman, I whipped up this recipe for BBQ marinaded and honey and cilantro basted chicken legs. Whip up the marinade (if you have some other BBQ marinade on hand, it would also work!) and dump it into a plastic bag. 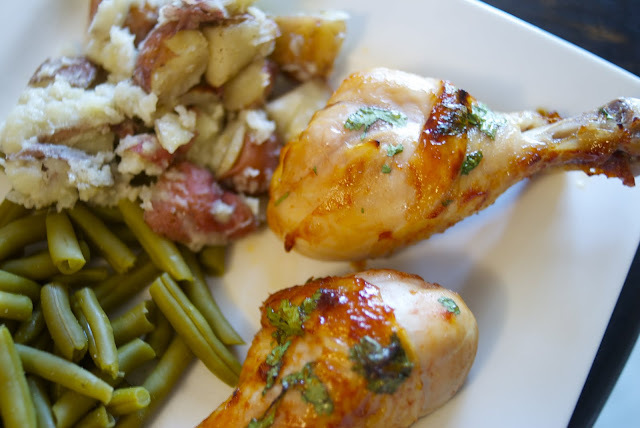 Dump the chicken in too (I used 1 lb of chicken legs, but breasts or thighs would also work!). Let the chicken soak up all the yummy marinade for about 4 or more hours. 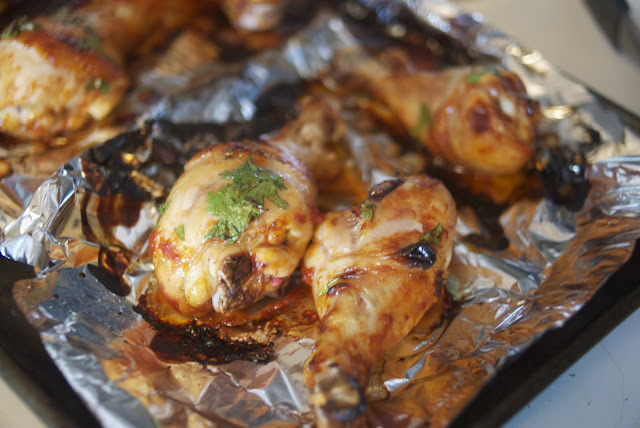 Preheat the oven to 400 degrees F. Prep a pan with tin foil and set the chicken legs on the pan. Bake for 15 minutes. While it's baking, whisk up the basting sauce. After 15 minutes, take the sauce and give it some lovin' with the honey, cilantro sauce. Get it on there good! Put the chicken back in for 15 minutes and then broil it for 1 minute before taking it out (times may be different for different cuts of chicken!). Let cool a bit. Eat! Yum! These look delicious! I love cilantro!